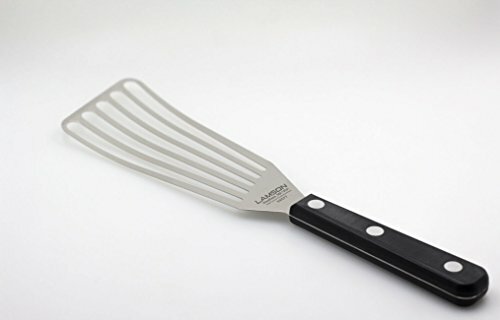 Lamson Chef’s Slotted Turner 3" x 6"
Lamson Chef's Slotted Turner with POM Handle is specially designed to flip delicate foods. The turner is lightweight, and razor-thin, so it can flip eggs, fish, and crepes. It is also strong enough to lift heavier foods like hamburgers. The long slots allow excess grease to drain. The Lamson Kitchen Tools feature hardened and tempered high-carbon stainless steel blades that are tapered or fine beveled, heat and water resistant and rugged POM handles secured with nickel silver rivets. Polyoxymethylene Thermoplastic (POM) handles combine the feel of wood with the easy care of plastic. They come with lifetime warranty against defects and are dishwasher safe. Lamson Products cutlery , kitchen tools and trade tools are still handcrafted in Massachusetts by American workers. We are proud to say that after 179 years, Lamson still produces the finest cutlery , kitchen tools and trade tools made in America that aim at nothing short of perfection. Lamson was established in Shelburne Falls, Massachusetts in 1837. As one of the oldest cutlery manufacturers in the United States, Lamson has been the choice of home and professional cooks as well as US Presidents for the last 179 years because of its high standard of craftsmanship. These traditions are true today not only in our cutlery and kitchen tools but in our barbeque equipment, TreeSpirit (Handcrafted North American Hardwood Kitchen Utensils and Wood Care Products) and HotSpot ( Professional Grade Silicone Potholders, Trivets, Hot Handles) products.